Composite view shows China’s Yutu rover and tracks driving in clockwise direction around Chang’e-3 lander from Above And Below (orbit and surface). 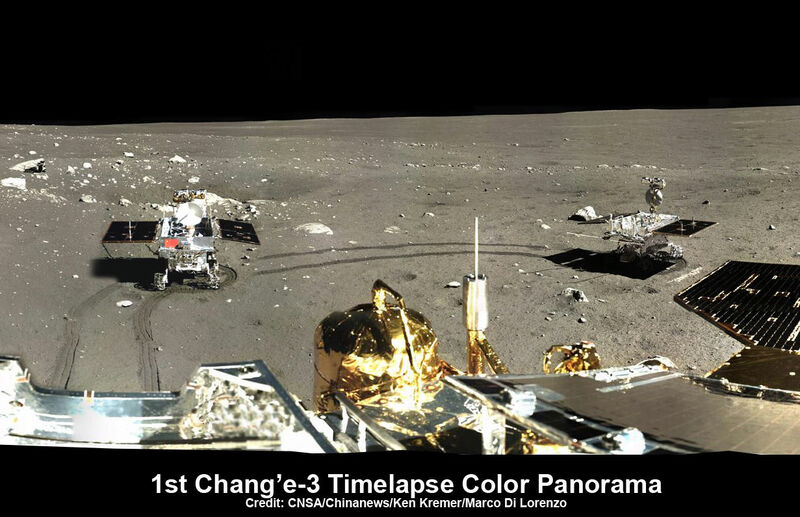 The Chang’e-3 timelapse lander color panorama (bottom) and orbital view (top) from NASA’s LRO orbiter shows Yutu rover after it drove down the ramp to the moon’s surface and began driving around the landers right side, passing by craters and heading south on Lunar Day 1. It then moved northwest during Lunar Day 2. Arrows show Yutu’s positions over time. The powerful telescopic camera aboard NASA’s Lunar Reconnaissance Orbiter (LRO) has captured spectacular new images detailing the traverse of China’s Yutu moon rover around the landing site during its first two months exploring the Moon’s pockmarked grey terrain. The newly released high resolution LRO images even show Yutu’s tracks cutting into the lunar surface as the world famous Chinese robot drove in a clockwise direction around the Chang’e-3 lander that delivered it to the ground in mid-December 2013. You can precisely follow Yutu’s movements over time – from ‘above and below’ – in our new composite view (shown above) combining the latest LRO image with our timelapse mosaic showing the rover’s history making path from the touchdown point last December to today’s location. Yutu is China’s first ever Moon rover and successfully accomplished a soft landing on the Moon on Dec. 14, 2013, piggybacked atop the Chang’e-3 mothership lander. Barely seven hours after touchdown, the six wheeled moon buggy drove down a pair of ramps onto the desolate gray plains of the lunar surface at Mare Imbrium (Sea of Rains) covered by volcanic material. Altogether three images of the rover and lander have been taken to date by the Lunar Reconnaissance Orbiter Camera (LROC) aboard LRO – specifically the hi res narrow angle camera (NAC). The LROC NAC images were captured on Dec. 25, 2013, Jan. 21, 2014 and Feb. 17, 2014 as LRO soared overhead. The four image LRO composite below includes a pre-landing image taken on June 30, 2013. Since the solar incidence angles were different, the local topography and reflectance changes between images showing different levels of details. “In the case of the Chang’e 3 site, with the sun higher in the sky one can now see the rover Yutu’s tracks (in the February image),” wrote Mark Robinson, Principal Investigator for the LROC camera in an LRO update. The solar powered rover and lander can only operate during periods of lunar daylight, which last 14 days each. During each lunar night, they both must power down and enter hibernate mode since there is no sunlight available to generate power and no communications are possible with Earth. Here is a gif animation from the NASA LRO team combining all four LROC images. During Lunar Day 1, Yutu drove down the landers ramps and moved around the right side in a clockwise direction. By the end of the first lunar day, Yutu had driven to a position about 30 meters (100 feet) south of the Chang’e-3 lander, based on the imagery. See our complete 360 degree timelapse color panorama from Lunar Day 1 herein and at NASA APOD on Feb. 3, 2014 – assembled by Marco Di Lorenzo and Ken Kremer. After awakening for Lunar Day 2, Yutu then moved northwest and parked about 17 meters (56 feet) southwest of the lander, according to Robinson. By comparing the Janaury and February images “it is apparent that Yutu did not move appreciably from the January location,” said Robinson. At this moment Yutu and the companion Chang’e-3 lander are sleeping through their 3rd Lunar Night. They entered hibernation mode on Feb. 22 and Feb. 23, 2014 respectively. Hopefully both probes will awaken from their slumber sometime in the next week when the Moon again basks in daylight glow to begin a 4th day of lunar surface science operations. “We all wish it would be able to wake up again,” said Ye Peijian, chief scientist of the Chang’e-3 program, according to CCTV, China’s state run broadcaster. However, the hugely popular ‘Yutu’ rover is still suffering from an inability to maneuver its life giving solar panels. It is also unable to move – as I reported here. The 140 kg rover is now nearing its planned 3 month long life expectancy on a moon roving expedition to investigate the moon’s surface composition and natural resources. Stay tuned here for Ken’s continuing Chang’e-3, Orion, Orbital Sciences, SpaceX, commercial space, LADEE, Mars and more planetary and human spaceflight news. Learn more at Ken’s upcoming presentations at the NEAF astro/space convention on April 12/13. Time for Earth to bid China’s Yutu Moon Rover Farewell ? 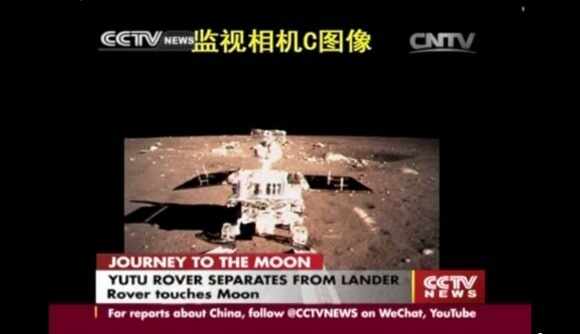 For a time, it seemed China’s maiden moon rover ‘Yutu’, beloved by millions worldwide, had been lost. But the death notice by Chinese officials turned out to be premature when a signal was detected a day later. It had been thought that Yutu froze to death due to a pre-hibernation mechanical malfunction and failed to wake up and communicate with China’s mission controllers in Beijing on Monday, Feb. 10, when daylight returned to the rovers Moon landing site at Mare Imbrium (Sea of Rains) at the start of what would have been Lunar Day 3 for the mission. “China’s first lunar rover, Yutu, could not be restored to full function on Monday [Feb. 10] as expected,” wrote the state owned Chinadaily.com, China News Service agency. The cause of the pre-hibernation malfunction may perhaps be traced back to a buildup of abrasive lunar dust, but no one knows at this time. Note: This story has been updated as further details emerged. Yutu has touched the hearts of countless Earthlings since the history making landing on the desolate gray plains of the the Moon atop the Chang’e-3 lander two month ago on Dec. 14, 2013. See our timelapse mosaic, artistic impression of Earthrise over Yutu – above – by the image processing team of Ken Kremer and Marco Di Lorenzo. It combines real images of the Moon’s surface terrain with an intentionally enlarged photo of Earth – all snapped by the Chang’e-3 lander – as a homage to the mission. See the complete timelapse mosaic herein and featured at NASA APOD on Feb 3, 2013. Although definitive word about the Chang’e-3 lander has not yet been announced, it is expected to survive and has a 1 year design lifetime. Potentially bad news about Yutu’s fate was not unexpected however, after Chinese space officials disclosed that the rover “experienced a mechanical control abnormality” two weeks ago, just as her 2nd lunar night was to begin, according to a report by China’s official government newspaper, The People’s Daily. “Yutu experienced mechanical problems on Jan 25 and has been unable to function since then,” according to Chinadaily.com, China News service. The six wheeled Yutu rover and Chang’e-3 mothership lander had just finished sleeping through the terribly frigid two week long lunar night since they entered their second hibernation period on Jan. 24th and 25th respectively, and Chinese space engineers had hoped to reawaken both probes in the past few days. No communications are possible during the period of nighttime dormancy. Yutu, which translates as ‘Jade Rabbit’ is named after the rabbit in Chinese mythology that lives on the Moon as a pet of the Moon goddess Chang’e. The piggybacked pair of Chinese probes safely touched down on the Moon at Mare Imbrium near the Bay of Rainbows on Dec. 14, 2013. Apparently one of Yutu’s solar panels did not fold back properly over the instrument laden mast after it was lowered to a horizontal position into a warmed electronics box where it is shielded and insulated from the extremely frigid lunar night time temperatures. Such a malfunction could spell doom for the fragile electronic and computer components in the unprotected mast mounted instruments and systems, including the color and navigation cameras and the high gain antenna. ‘Jade Rabbit’ had departed the landing site forever, and was journeying southwards as the incident occurred – about six weeks into its planned 3 month long moon roving expedition to investigate the moon’s surface composition and natural resources. The 140 kg Yutu robot drove off a pair of ramps and onto the moon seven hours after the Dec. 14, 2013 touchdown. They were designed to conduct their science investigations and work independently of one another. China can be proud of its magnificent space flight accomplishment. Chang’e-3 was the first spacecraft from Earth to soft land on the Moon in nearly four decades since the touchdown of the Soviet Union’s Luna 24 sample return spacecraft back in 1976. America’s last visit to the Moon’s surface occurred with the manned Apollo 17 landing mission – crewed by astronauts Gene Cernan and Harrison ‘Jack’ Schmitt , who coincidentally ascended from the lunar soil on Dec. 14, 1972 – exactly 41 years before Chang’e-3. China’s follow on Chang’e-4 Moon lander is due to blastoff in 2015. Surely the science and engineering team will incorporate valuable lessons learned. China’s now famous ‘Yutu’ moon rover has set sail for what promises to be breathtaking new adventures on Earth’s nearest neighbor, after completing a final joint portrait session with the Chang’e-3 lander that safely deposited her on the lunar surface only a week ago. Yutu’s upcoming journey marks humanity’s first lunar surface visit in nearly four decades since the Soviet Union’s Luna 24 sample return vehicle visited. America’s last lunar landing mission with the Apollo 17 astronauts departed 41 years ago on Dec. 14, 1972. The Chang’e-3 mothership and Yutu rover have resumed full operations after awakening from a sort of self induced slumber following commands from Mission Control back in Beijing. The lander and rover finished up their 5th and final dual picture taking session – in living lunar color – on Sunday, Dec. 22, according to CCTV, China’s state run broadcast network. “Ten pictures have been taken at five spots so far, and all of them are better than we expected,” said Wu Weiren, chief designer of the China Lunar Probe Program, to CCTV. See the newly released portraits from photo session 5 – above and below. The rover and lander have taken photos of each other for the fifth and final time. The back side of Chang’e 3 lander as seen by rover Yutu with Chinese national flag at left imaged for the first time. After arriving on the moon, Yutu and the lander took an initial pair of portraits of one another. Read my earlier report – here. Yutu was then directed to travel in a semicircular path around the lander and to the south, making tracks several centimeters deep into the loose lunar regolith. But within two days of the historic Dec. 14 touchdown, the two spacecraft took a four-day break that lasted from Dec. 16 to Dec. 20, during which China’s space engineers shut down their subsystems, according to China’s State Administration of Science, Technology and Industry for National Defense (SASTIND). The vehicles took a ‘nap” to deal with direct solar radiation that significantly raised their temperatures. Yutu’s sunny side exceeded 100 degrees centigrade while the shaded side was simultaneously below zero, reported SASTIND. “The break had been planned to last until Dec. 23, but the scientists decided to restart Yutu now for more research time, based on the recent observations and telemetry parameters,” said Pei Zhaoyu, spokesman for the Chinese lunar program, according to China’s Xinhua state news agency. Both robots then snapped additional photos of one another during the traverse from each of five specific and preplanned locations. See accompanying traverse map below – written in Chinese. These images taken by Yutu were designed to show the 1200 kg Chang’e-3 lander from the front, side and back sides as it drove around the right side – for better illumination – at a distance of about 10 meters. The final image of the Chang’e-3 lander taken by Yutu also captured China’s national flag emblazoned on the lander for the first time, since this was the first time it was in view of the rover’s camera eyes. See the accompanying traverse graphic here – written in Chinese. Having fulfilled the last of their joint tasks, the two spacecraft can therefore each begin their own lunar exploration missions, working independently of one another exactly as planned from the outset of China’s inaugural moon landing feat. Yutu will depart the Chang’e-3 landing zone forever and begin its own lunar trek that’s expected to last at least 3 months – and perhaps longer if it’s delicate electronic components survive the moon’s utterly harsh and unforgiving space environment. “They will begin to conduct scientific explorations of the geography and geomorphology of the landing spot and nearby areas, and materials like minerals and elements there. We will also explore areas 30 meters and 100 meters beneath the lunar soil. The exploration will continue longer than we planned, because all the instruments and equipments are working very well,” noted Wu Weiren. The robotic pair of spacecraft safely soft landed on the Moon on Dec. 14 at Mare Imbrium, nearby the Bay of Rainbows, or Sinus Iridum region. Barely seven hours after the history making touchdown, ‘Yutu’ was painstakingly lowered from its perch atop the lander and then successfully drove all six wheels onto the moon’s surface on Dec. 15. The Chang’e-3 mothership captured a panoramic view of the stark lunar terrain surrounding the spacecraft after ‘Yutu’ drove some 9 meters away from the lander. See the eerie panoramic view of the landing site showing Yutu’s first moments on the alien lunar surface in my prior story – here. See the dramatic video with an astronauts eye view of the lunar descent and touchdown in my prior story – here. The 120 kg Yutu rover is almost the size of a golf cart. It measures about 1.5 m x 1 m on its sides and stands about 1.5 m (nearly 5 feet) tall – virtually human height. Yutu, which translates as ‘Jade Rabbit’ will use its suite of four science instruments to survey the moon’s geological structure and composition to locate the moon’s natural resources for use by potential future Chinese astronauts, perhaps a decade from now. This screen shot from one photo of many of the moons surface snapped by the on-board descent imaging camera of the Chinese lunar probe Chang’e-3 on Dec. 14, 2013 shows the probe approaching the Montes Recti mountain ridge and approximate location of the landing site in Mare Imbrium. This marks the first time that China has sent a spacecraft to soft land on the surface of an extraterrestrial body. Image and video rotated 180 degrees. China accomplished a major technological and scientific feat when the country’s ambitious Chang’e-3 robotic spacecraft successfully soft landed on the Moon on Dec. 14 – on their very first attempt to conduct a landing on an extraterrestrial body. Along the way the descent imaging camera aboard the Chang’e-3 lander was furiously snapping photos during the last minutes of the computer guided descent. For a firsthand look at all the thrilling action, be sure to check out the stunning landing video, below, which gives an astronauts eye view of the dramatic descent and touchdown by China’s inaugural lunar lander and rover mission. The video was produced from a compilation of descent camera imagery. The version here has been rotated 180 degrees – so you don’t have to flip yourself over to enjoy the ride. And it truly harkens back to the glory days of NASA’s manned Apollo lunar landing program of the 1960’s and 1970’s. The dramatic Chang’e-3 soft landing took place at Mare Imbrium at 8:11 am EST, 9:11 p.m. Beijing local time, 1311 GMT, which is to the east of the announced landing site on the lava filled plains of the Bay of Rainbows, or Sinus Iridum region. The precise landing coordinates were 44.1260°N and 19.5014°W -located below the Montes Recti mountain ridge and about 40 kilometers south of the 6 kilometer diameter crater known as Laplace F – see image below. The video begins as Chang’e-3 is approaching the Montes Recti mountain ridge which is about 90 km in length. Its peaks rise to nearly 2 km. Chang’e-3 carried out the rocket powered descent to the Moon’s surface by firing the landing thrusters starting at the altitude of 15 km (9 mi) for a soft landing targeted to a preselected area in Mare Imbrium. The vehicles thrusters then fire to pivot the lander towards the surface at about the 2:40 minute mark when it’s at an altitude of roughly 3 km. The powered descent was autonomous and preprogrammed and controlled by the probe itself, not by mission controllers on Earth stationed at the Beijing Aerospace Control Center (BACC) in Beijing. Altogether it took about 12 minutes using the variable thrust engine which can continuously vary its thrust power between 1,500 to 7,500 newtons. The variable thrust engine enabled Chang’e-3 to reduce its deceleration as it approached the moons rugged surface. The 1200 kg lander was equipped with unprecedented terrain recognition equipment and software to hover above the landing site and confirm it was safe before proceeding. This enabled the craft to avoid hazardous rock and boulder fields as well as craters in the pockmarked terrain that could spell catastrophe even in the final seconds before touchdown, if the vehicle were to land directly on top of them. The descent engine continued firing to lower the lander until it was hovering some 100 meters above the lunar surface – at about the 5:10 minute mark. After hovering for about 20 seconds and determining it was safe to proceed, the lander descended further to about 3 meters. The engine then cut off and the lander free fell the remaining distance. The impact was cushioned by shock absorbers. There is a noticeable dust cloud visible on impact as the Chang’e-3 mothership touched down atop the plains of Mare Imbrium. Barely 7 hours later, China’s first ever lunar rover ‘Yutu’ rolled majestically down a pair of ramps and onto the Moon’s soil on Sunday, Dec. 15 at 4:35 a.m. Beijing local time. The six wheeled ‘Yutu’, or Jade Rabbit, rover drove straight off the ramps and sped right into the history books as it left a noticeably deep pair of tire tracks behind in the loose lunar dirt. The stunning feat was broadcast on China’s state run CCTV. Image shows the trajectory of the lunar probe Chang’e-3 approaching the landing site on Dec. 14. China’s first ever lunar rover rolled majestically onto the Moon’s soil on Sunday, Dec. 15, barely seven hours after the Chang’e-3 mothership touched down atop the lava filled plains of the Bay of Rainbows. Check out the gallery of stunning photos and videos herein from China’s newest space spectacular atop stark lunar terrain. The six wheeled ‘Yutu’, or Jade Rabbit, rover drove straight off a pair of ramps at 4:35 a.m. Beijing local time and sped right into the history books as it left a noticeably deep pair of tire tracks behind in the loose lunar dirt. The stunning feat was broadcast on China’s state run CCTV using images transmitted to Earth from cameras mounted on the Chang’e-3 lander and aimed directly at the rear of the departing moon buggy. The scene was reminiscent of NASA’s Mars Sojourner rover driving of the Mars Pathfinder lander back in 1997. 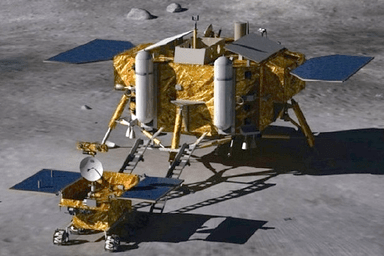 Chinese space engineers based at the Beijing Aerospace Control Center (BACC) carefully extended a pair of ramps out from the lander in a complex process, drove Yutu onto the ramps and then gently lowered them onto the moon’s soil. China’s Change’-3 mission had just safely soft landed on the Moon hours only earlier on Saturday, Dec. 14 at 9:11 p.m. Beijing time, 8:11 EST at the Sinus Iridum region, or Bay of Rainbows. China thus became only the 3rd country in the world to successfully land a spacecraft on Earth’s nearest neighbor after the United States and the Soviet Union. It’s been nearly four decades since the prior lunar landing was accomplished by the Soviet Union’s Luna 24 sample return spacecraft. Read my detailed account of the Chang’e-3 landing on Dec. 14 – here. Over 4600 images have already been transmitted by Chang’e-3 in less than a day on the Moon. Tomorrow, the 120 kg Yutu rover will begin driving in a circle around the 1200 kg lander. And the pair of lunar explorers will snap eagerly awaited portraits of one another! The rover and lander are equipped with 8 science instruments multiple cameras, spectrometers, an optical telescope, ground penetrating radar and other sensors to investigate the lunar surface and composition. China scored a stunning, history making success with the successful touchdown of the ambitious Chang’e-3 probe with the ‘Yutu’ rover on the surface of the Moon today, Dec. 14, on the country’s first ever attempt to conduct a landing on an extraterrestrial body. The dramatic Chang’e-3 soft landing on the lava filled plains of the Bay of Rainbows occurred at about 8:11 am EST, 9:11 p.m. Beijing local time, 1311 GMT today. The monumental feat is the first landing on the Moon by any entity in nearly four decades. It was broadcast live on CCTV, China’s state run television network. This maiden Chinese moon landing marks a milestone achievement for China and clearly demonstrates the country’s technological prowess. A tidal wave of high fives was unleashed by the huge teams of Chinese space engineers teams controlling the flight from the Beijing Aerospace Control Center (BACC). There was also a huge sense of relief from the nail biting tension upon confirmation of the successful soft landing following many years of hard work and intense planning. The Chang’e-3 mission entails the first soft landing on the Moon by anyone since the Soviet Union’s unmanned Luna 24 sample return vehicle touched down back in 1976. Artists concept of the rocket assisted landing of China’s lunar probe Chang’e-3. China now joins an elite club of three, including the United States, who have mastered the critical technology required to successfully touch down on Earth’s nearest neighbor. China’s space vision also stands in total contrast to the utter lack of vision emanating from so called political leaders in Washington, DC who stymie NASA and US science at every opportunity! ‘Yutu’ could very well serve as a forerunner for testing the key technologies required for a Chinese manned lunar landing in the next decade. The Chang’e-3 mission is comprised of China’s ‘Yutu’ lunar lander riding piggyback atop a much larger four legged landing vehicle. The Chang’e-3 lander transmitted its first images of the moon in real time during its approach to the lunar surface during the final stages of the ongoing landing operation carried live by CCTV. A total of 59 images were received instead of the 10 expected, said a CCTV commentator. The voyage from the Earth to the Moon began 12 days ago with the flawless launch of Chang’e-3 atop China’s Long March 3-B booster at 1:30 a.m. Beijing local time, Dec. 2, 2013 (12:30 p.m. EST, Dec. 1) from the Xichang Satellite Launch Center, in southwest China. Chang’e-3 made a rocket powered descent to the Moon’s surface today by firing the landing thrusters starting at the altitude of 15 km (9 mi) for a soft landing targeted to a preselected area on the Bay of Rainbows. The powered descent was autonomous and took about 12 minutes. The variable thrust engine can continuously vary its thrust power between 1,500 to 7,500 newtons. It was the biggest ever used by China in space said a commentator on CCTV. The variable thrust engine enabled Chang’e-3 to reduce its deceleration as it approached the moon. The descent was preprogrammed and controlled by the probe itself, not from the ground. The 1200 kg lander is equipped with unprecedented terrain recognition equipment and software to hover above the landing site and confirm it was safe. This enabled the craft to avoid rock and boulder fields that could spell catastrophe even in the final seconds before touchdown if the vehicle were to land directly on top of them. The descent engine fired until the lander was about hovering 100 meters above the lunar surface. After determining it was safe to proceed, the lander descended further to about 3 meters. The engine then cut off and the lander free fell the remaining distance. The impact was cushioned by shock absorbers. The solar panels soon unfurled. They are the most efficient Chinese solar panels available, said a CCTV commentator. It was imaged in high resolution by China’s prior lunar mission – the Chang’e-2 lunar orbiter – and is shown in graphics herein. The Yutu rover is also unfurling its solar panels and mast today. Yutu, which translates as Jade Rabbit, stands 150 centimeters high, or nearly 5 feet – human height. It weighs approximately 120 kilograms and sports a robotic arm equipped with advanced science instruments. On Sunday, the six-wheeled ‘Yutu’ rover with a rocker bogie suspension similar to NASA’s Mars rovers will be lowered in stages to the moon’s surface in a complex operation and then drive off a pair of landing ramps to explore the moon’s terrain for at least three months. In what promises to be a space spectacular, the lander and rover are expected to photograph one another soon after Yutu rolls onto the Bay of Rainbows. The rover and lander are equipped with multiple cameras, spectrometers, an optical telescope, ground penetrating radar and other sensors to investigate the lunar surface and composition. The Chang’e-3 lander is powered by a combination of solar arrays and a nuclear battery said CCTV, in order to survive the two week long lunar nights. 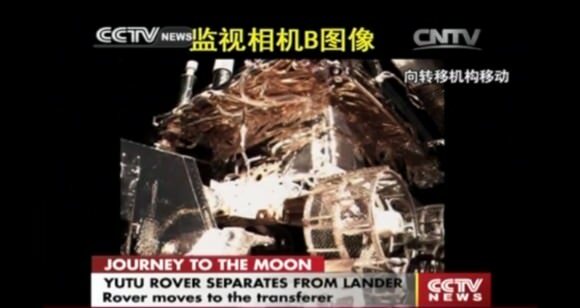 Chinese space officials expect the lander will function a minimum of 1 year. ESA’s network of tracking stations are providing crucial support to China for Chang’e-3 from launch to landing. All systems appear to be “GO” for the world’s first attempt to soft land a space probe on the Moon in nearly four decades. China’s maiden moon landing probe – Chang’e-3 – is slated to attempt the history making landing this weekend on a lava plain in the Bay of Rainbows, or Sinus Iridum region. Chinese space engineers at the Beijing Aerospace Control Center (BACC) paved the way for the historic touchdown by successfully commanding Chang’e-3 to descend from the 100 km-high lunar circular orbit it reached just one week ago on Dec. 6, to “an elliptical orbit with its nearest point about 15 km away from the moon’s surface”, according to a statement from China’s State Administration of Science, Technology and Industry for National Defense (SASTIND). The first pictures taken from the alien lunar surface in some 37 years are expected to be transmitted within days or hours of touchdown planned as early as Saturday, Dec. 14, at 9:40 p.m. Beijing local time, 8:40 a.m. EST. CCTV, China’s state run network, carried the launch live. It remains to be seen whether they will have live coverage of the landing since there have been no programming announcements. SASTIND said the orbit lowering thruster firing was “conducted above the dark side of the moon at 9:20 p.m.” on Dec. 10, Beijing local time. Confirmation of the Chang’e-3 probes new, lower orbit was received four minutes later. If successful, the Chang’e-3 mission will mark the first soft landing on the Moon since the Soviet Union’s unmanned Luna 24 sample return vehicle landed back in 1976. China would join an elite club of three, including the United States, who have mastered the critical technology to successfully touch down on Earth’s nearest neighbor. The Chang’e-3 mission is comprised of China’s ‘Yutu’ lunar lander riding piggyback atop a much larger four legged landing probe. Chang’e-3 will make a powered descent to the Moon’s surface on Dec. 14 by firing the landing thrusters at the altitude of 15 km (9 mi) for a soft landing in a preselected area on the Bay of Rainbows. The powered descent will take about 12 minutes. The variable thrust engine can continuously vary its thrust power between 1,500 to 7,500 newtons, according to Xinhua. The Bay of Rainbows is located in the upper left portion of the moon as seen from Earth. It was imaged in high resolution by China’s prior lunar mission – the Chang’e-2 lunar orbiter. The 1200 kg lander is equipped with terrain recognition equipment and software to avoid rock and boulder fields that could spell catastrophe even in the final seconds before touchdown if the vehicle were to land directly on top of them. Chang’e-3 is powered by a combination of solar arrays and a nuclear device in order to survive the two week long lunar nights. The six-wheeled ‘Yutu’ rover, with a rocker bogie suspension, will be lowered in stages to the moon’s surface in a complex operation and then drive off a pair of landing ramps to explore the moon’s terrain. Yutu measures 150 centimeters high and weighs approximately 120 kilograms and sports a robotic arm equipped with science instruments. The radar instrument installed at the bottom of the rover can penetrate 100 meters deep below the surface to study the Moon’s structure and composition in unprecedented detail. China’s maiden moon landing probe successfully entered lunar orbit on Friday, Dec. 6, following Sunday’s (Dec. 1) spectacular blastoff – setting the stage for the historic touchdown attempt in mid December. Engineer’s at the Beijing Aerospace Control Center (BACC) commanded the Chang’e 3 lunar probe to fire its braking thrusters for 361 seconds, according to China’s Xinhua news agency. The do or die orbital insertion maneuver proceeded precisely as planned at the conclusion of a four and a half day voyage to Earth’s nearest neighbor. China’s ‘Yutu’ lunar lander is riding piggyback atop the four legged landing probe during the history making journey from the Earth to the Moon. The critical engine burn placed Chang’e 3 into its desired 100 kilometer (60 mi.) high circular orbit above the Moon’s surface at 5:53 p.m. Friday, Beijing Time (4:53 a.m. EST). An engine failure would have doomed the mission. 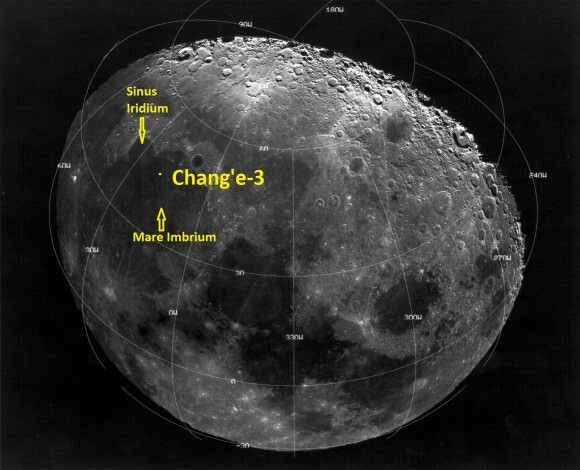 Chang’e 3 is due to make a powered descent to the Moon’s surface on Dec. 14, firing the landing thrusters at an altitude of 15 km (9 mi) for a soft landing in a preselected area called the Bay of Rainbows or Sinus Iridum region. The Bay of Rainbows is a lava filled crater located in the upper left portion of the moon as seen from Earth. It is 249 km in diameter. The lander is equipped with terrain recognition equipment and software to avoid rock and boulder fields that could spell catastrophe in the final seconds before touchdown if vehicle were to land directly on top of them. The voyage began with the flawless launch of Chang’e 3 atop China’s Long March 3-B booster at 1:30 a.m. Beijing local time, Dec. 2, 2013 (12:30 p.m. EST, Dec. 1) from the Xichang Satellite Launch Center, in southwest China. If successful, the Chang’e 3 mission will mark the first soft landing on the Moon since the Soviet Union’s unmanned Luna 24 sample return vehicle landed nearly four decades ago back in 1976. The name for the ‘Yutu’ rover – which means ‘Jade Rabbit’ – was chosen after a special naming contest involving a worldwide poll and voting to select the best name. ‘Yutu’ stems from a Chinese fairy tale, in which the goddess Chang’e flew off to the moon taking her little pet Jade rabbit with her. The six-wheeled ‘Yutu’ rover will be lowered in stages to the moon’s surface in a complex operation and then drive off a pair of landing ramps to explore the moon’s terrain. Yutu measures 150 centimeters high and weighs approximately 120 kilograms. The rover and lander are equipped with multiple cameras, spectrometers, an optical telescope, radar and other sensors to investigate the lunar surface and composition. Chang’e 3 marks the beginning of the second phase of China’s lunar robotic exploration program. The lander follows a pair of highly successful lunar orbiters named Chang’e 1 and 2 which launched in 2007 and 2010. The next step will be an unmanned lunar sample return mission, perhaps by 2020. China’s Chang’e 3 probe joins NASA’s newly arrived LADEE lunar probe which entered lunar orbit on Oct. 6 following a similarly spectacular night time blastoff from NASA’s Wallops Flight Facility in Virginia. Stay tuned here for continuing Chang’e 3, LADEE, MAVEN and MOM news and Ken’s SpaceX and MAVEN launch reports from on site at Cape Canaveral & the Kennedy Space Center press site.